Like many people I know, my sense of reality was jolted when the image of three year old Aylan Kurdi, dead on a Turkish beach, began to wash across my social media feeds. I have not been oblivious to the growing refugee crisis, nor the politics which has caused it, but it was that image that really made me sit up and take notice. The innocence, the helplessness, the sense of vanquished hope. And, more than a little bit, the way in which that poor boy’s lifeless body resembled that of my son as he sleeps. There has been scepticism of course: why should this image suddenly trigger such an outpouring of emotion when 10,000 Syrian children have died in this conflict so far? Why should the sinking of this boat be any different to the hundreds of others that have met the same fate? But for whatever reason, it touched a chord – as powerful images so often do. And the real galvanising moment for me – more than the image itself – was our government’s response to it. That Cameron could stand his ground and insist that we, as a country, would not be offering asylum to any more refugees was the thing that made me realise that we, as a country, needed to take a stand. I’ve been thinking about it, and it’s only really the second time in my life that I have been moved to really engage with politics on a grassroots level. The first was with the Stop the War Coalition back in the early 2000s. It feels like a lifetime ago, but of course the atrocities we were campaigning against then have directly influenced the state the world finds itself in now. It feels like there is a similar sense of camaraderie emerging, a belief that we as individuals can have some influence on the power of the state. And this time we have an incredible bank of ammunition at our fingertips that we didn’t have before: that of social media. Thanks to Facebook and Twitter, I have found a home for a collection of musical instruments I’d been tasked with distributing in the wonderful Music Against Borders group. I have discovered that there are numerous people in my little town who care just as much as I do, and am working to put together relief packages to give to those of them who are willing to coordinate the delivery of goods to Calais and further afield. And I am preparing to take my two year old son on his first political March in London on the 12th of September, linking up with like-minded friends who I otherwise may not have even known were planning on going too. And then there’s my blog. It’s been languishing for a little while whilst I work out what to do with it. The blogosphere can, at times, feel so filled with flim flam that adding your own contribution to the mix really doesn’t seem so worthwhile. But then I was asked to be involved in the Save Syria’s Children campaign and everything began to fall into place. Whatever the politics, whatever the fears of the Western world for their own comforts and security, there are hundreds of thousands of people who are simply desperate to find a better life – no, scratch that, a LIFE for their children. I thought about those children, about Aylan and Galip and the thousands more like them, as I tried to persuade Arthur to sit still for long enough for me to take his picture for this campaign. As his little spirit fought against everything I asked of him, I tried to imagine what it could possibly be like to cajole a toddler to sit calmly through an endless ocean crossing, crammed into a tiny boat and surrounded by terror. I can only imagine that the terror must be contagious, that those tiny children are just paralysed by the fear emanating from all of the brave and wonderful adults around them who are doing everything they can to find a place of safety. I think we need to help those adults, those parents and uncles and aunts and grandparents. We need to help them keep their children safe. This campaign is just a tiny part of the colossal efforts being undertaken by Save the Children to find some way of compensating for the despicable hand the world has dealt the children of Syria. Share an image of a child who is important to you to bring home the message that those 10,000 dead Syrian children, and the millions more at risk, are first and foremost children, and human beings. 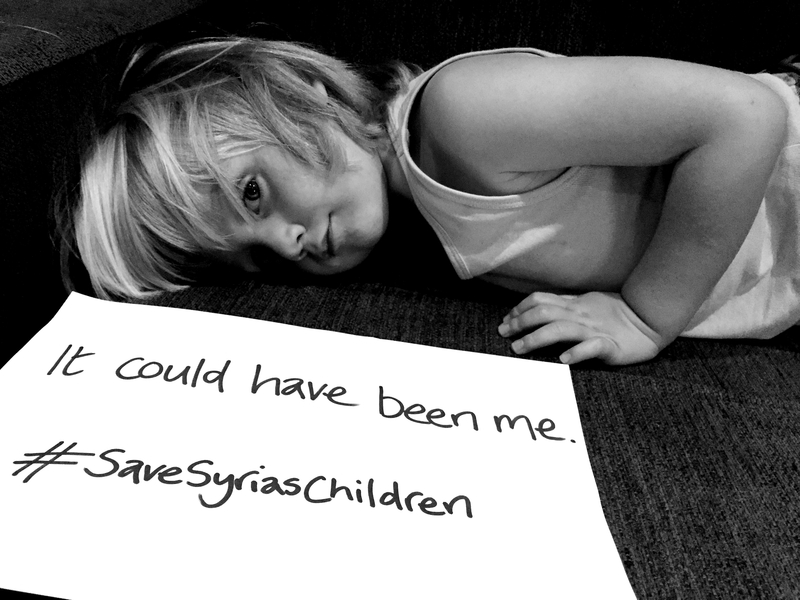 Text 70008 and the word SYRIA to donate £5 to the Save the Children campaign. This entry was posted in Sophie is pondering and tagged #refugeeswelcome, #savesyriaschildren, Refugees, Save the Children on September 5, 2015 by sophieblovett. This is a beautiful post about something I’ve been wanting to write about myself. And more importantly do something about. Will tweet. Sadly the country I live in is not overly interested in helping even though we’ve been received a lot of refugees from perilous crossings. No Save the Children movement here!